When asking someone “how was your Christmas?” we often receive a reply along the lines of “it was lovely! And I’m so glad it’s over!” I heard that just this morning, and on this, the 12th day of Christmas, I was reminded of something I read recently on Twitter. How can we keep the magic of Christmas? In recent years, my church has started doing the children’s Christmas pageant as an Epiphany pageant, which I think is a great idea. My own home decorations stay up until Epiphany. Here in the the sugar country of south Louisiana, families whose lives follow the calendar of grinding often find alternative dates to celebrate when grinding isn’t finished by Christmas (often the case). But the feeling of relief that “Christmas is over until next year – WHEW!” is a little sad and bittersweet. To be sure, Christmas IS a sad time for many, filled with bittersweet moments for nearly all of us. We are reminded of loved ones who are no longer with us; we are reminded of the changes in our lives and the lives of those around us. We look at the changes in the world, and (human nature being what it is), we focus on the things we lack and the things we miss while often glossing over the positive changes. Even the wonderful things about the Christmas season (time with loved ones, community worship, giving) tend to overwhelm us, and I think it’s because we try to squeeze it all into such a short period of time! Shouldn’t that be a good reason to remind ourselves that yes, there are twelve days of Christmastide, and we all pretty much get started celebrating Christmas during Advent anyway. So why all the stress? Maybe it’s because we want to ignore the things that hurt us, the painful memories, and the wondering-what-next-year-will-hold. The sad irony is that the very gift of Christmas, the miracle of the Incarnation, should be the healing salve that tends the wounds of the less-than-Hallmark-perfect holiday – and so often we forget about that miracle. I’ll be packing up my Christmas decorations today and tomorrow, with the exception of the Nativity. (After all, the wise men don’t arrive until tomorrow, anyway.) As I do so, I’ll be revisiting the memories of Christmas past and be grateful for them. I’ll challenge myself to bring the beauty and miracle of the Incarnation into all of 2019. Tomorrow, I’ll watch our Epiphany Christmas Pageant, sing Christmas carols, and enjoy the first king cake of the season – and maybe find a plastic baby Jesus inside the cake. I’m welcoming baby Jesus into my heart, and hope that you do, too. Merry Christmas, and God bless us everyone. Last night at the Christmas Eve service, Fr. Matt gave his usual children’s sermon about the young boy, Emmanuel, who wanted to know what language God spoke. The answer, of course, is that God’s language is love. The “grown-up sermon” changes each year, but we’ve heard Emmanuel’s story before and I’m always glad to hear it again as the message remains fresh. Christmas whispers in God’s language to our weary souls, and it can be hard to hear those whispers over the din of the season. Christmas whispers of hope in a broken world. Christmas reminds us that in the face of all of the messy-ness, the smallest, most seemingly inconsequential event brings love and light. I think that God often hides miracles in plain sight. Maybe Christmas will bring healing to the sick, dignity and sustenance to the impoverished, and reconciliation to the divided. Or, maybe not just yet. If we listen, though, Christmas brings hope, light and love. We are broken, and remain in this human condition. The media’s message of Christmas is perfection in an imperfect world; the real message of Christmas is love and redemption in spite of our imperfection. May you have a blessed Christmas, filled with love. I rarely watch movies in a movie theater. There aren’t that many that tempt me to sit in a semi-comfortable seat for a couple of hours. Last night, I made an exception and went to a movie that woke me up at 4 AM, unable to get back to sleep. It was a movie about America’s most prolific serial killer, who was finally – after three decades of murder – apprehended, brought to trial and put away for life. Surprisingly, it’s not filled with gory scenes and graphic death. 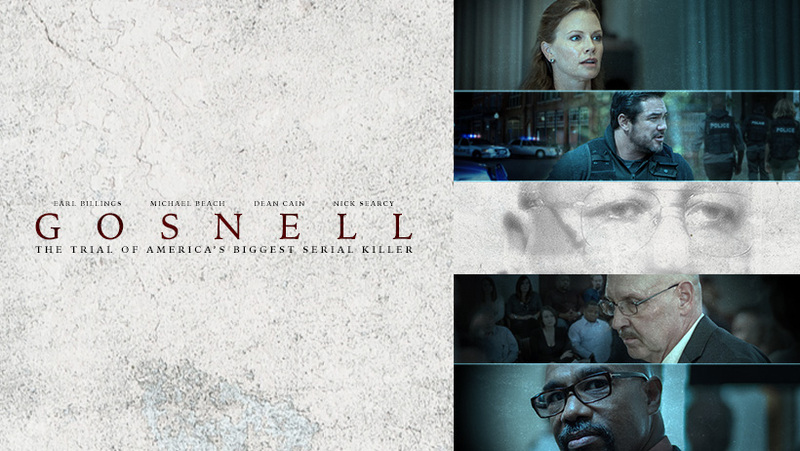 It’s a true story: Gosnell, The Trial of America’s Biggest Serial Killer. It’s the story of Dr. Kermit Gosnell. Gosnell was a doctor in Philadelphia, who ran an abortion clinic, The Women’s Medical Society, for over 30 years. His clinic had been the subject of numerous complaints and an occasional reprimand and fine from the Pennsylvania Health Department. He repeatedly ignored health regulations, utilized unlicensed and untrained personnel, and had many patients with complications. In fact, over 40 lawsuits had been filed against him over a 30-year period. Yet, his clinic continued to operate. The movie begins as FBI agents and state police execute a raid on the clinic. They aren’t there to investigate the filthy, shoddy medical practices; instead, they are investigating the “pill mill” that Dr. Gosnell was running, selling prescriptions for painkillers to drug dealers. As the team moves throughout the clinic, we see conditions that are filthy, dangerous, and disgusting. Detective James “Woody” Woods prepares to enter Gosnell’s clinic. 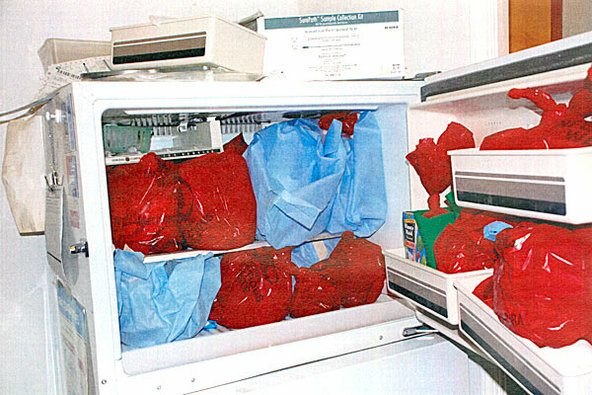 Biohazard sacks are filled with medical waste and stacked up everywhere, in freezers and even in the stairwells. Cats roam freely, and Gosnell proudly informs the team just how many rodents had been dispatched from the clinic by one particular cat. Anyone with knowledge of how ANY medical clinic is set up will be horrified to see the setup and filth and the broken, unused equipment. In the refrigerator were specimen jars, with tiny pairs of perfectly formed feet. Each one was neatly labeled. DNA purposes, said Dr. Gosnell. He calmly attended a woman who was waiting on her abortion while the team was there, and then proceeded to munch on Chinese takeout while still wearing his bloody gloves. The story unfolded as the case proceeded to a grand jury and on to trial. We hear from witnesses and learn the story of the death of Karnamaya Mongar, a woman who had gone to Gosnell for an abortion. 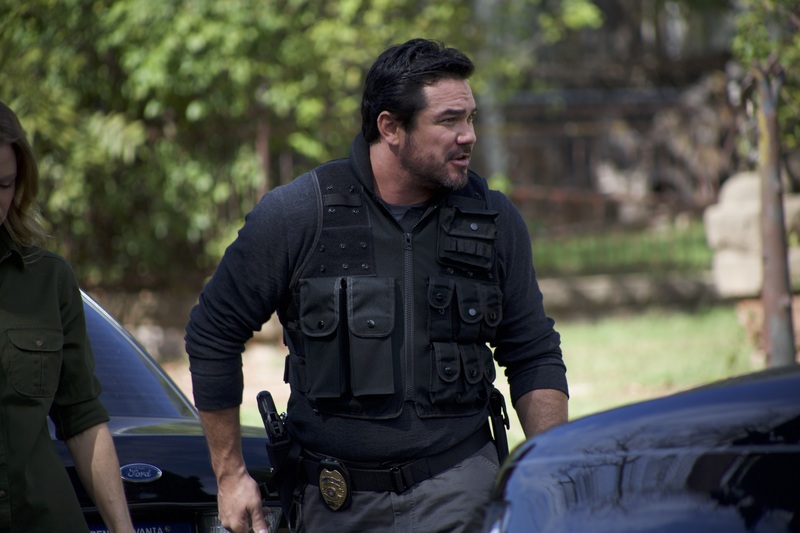 The Department of Health had decided to ignore the incident, but Detective James “Woody” Wood (played by Dean Cain) makes it a point to NOT ignore the death. While there is plenty of evidence at the clinic and in Gosnell’s home to confirm that he is indeed selling prescriptions for Oxycontin and other painkillers, there is also much evidence that he has routinely performed abortions well past Pennsylvania’s 24-week limit on abortions, and has, in fact, murdered babies who were born alive. 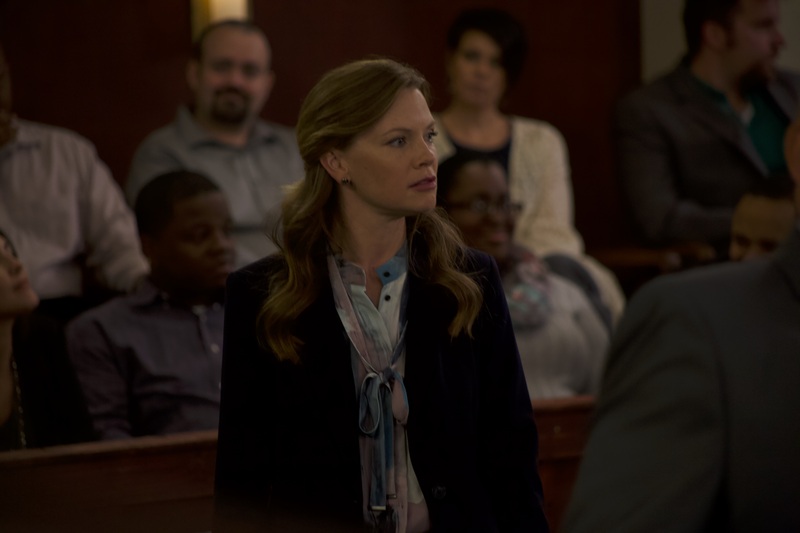 ADA Lexy McGuire (played by Sarah Jane Morris) prosecutes Gosnell. While witnesses are badgered by defense attorney Mike Cohan (played by Nick Searcy), we think that the jury just might decide in favor of the defendant…until one former employee of the clinic, Betty Goodwin (played by Dominique Deon) approaches Woody and another detective with a photo of “Baby Boy A,” a child who was delivered alive by Gosnell. Baby Boy A breathed, moved, and cried until Gosnell snipped his spinal cord, ending the life of this newborn. We don’t see the child’s photo in the movie. (It is available on the movie website.) We only see the reactions of those in the courtroom as they look upon this perfectly formed infant. In that moment, we realize the true evil of this killer, described by many as “charming.” Indeed, Gosnell (played by Earl Billings) is the smiling, charming face of evil. 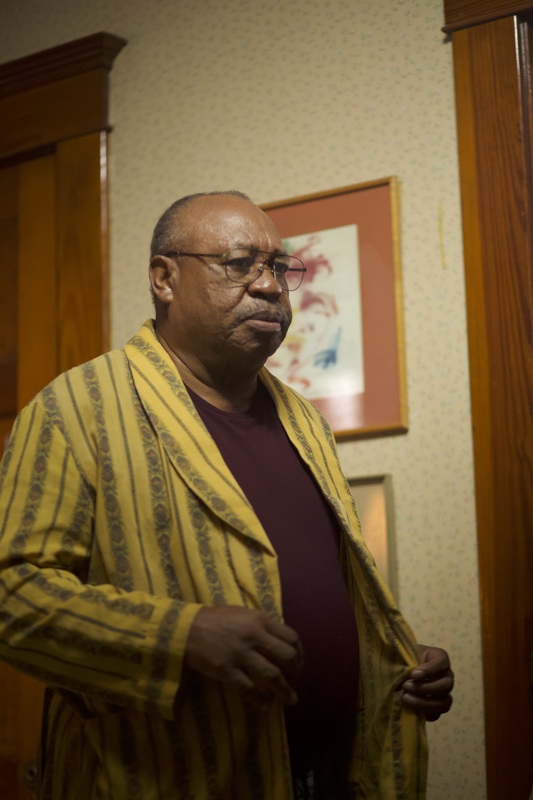 Earl Billings plays a charming Dr. Kermit Gosnell. He offers to cook breakfast for the detectives executing a search warrant in his home. They decline. Gosnell’s clinic was an abomination, and we wonder how he was left to operate for so many years. We learn that the governor of Pennsylvania had told the Department of Health “hands off” Kermit Gosnell’s clinic. Perhaps this is because abortion is seen as a “hot button” topic. Regardless of where one stands on that issue, no one could possibly agree that Gosnell was acting in the best interests of his female patients. Even the most staunch pro-choice believer would have to agree that Gosnell’s killing of infants who were alive is clearly murder. While the trial found him guilty of murder of three infants and one adult woman, there were other infant bodies that pointed to the fact that these three babies were just the tip of the iceberg. This was a movie well worth my time. I had read the book, and so had some knowledge of the facts about Gosnell. The book, Gosnell: The Untold Story of America’s Most Prolific Serial Killer (Ann McElhinney, Phelim McAleer) is completely documented. The scenes depicted in the movie were not exaggerations, they were based on actual evidence from the crime scene. Interestingly, the New York Times initially refused to list the book on its bestseller’s list – even though it was number 3 on Amazon and Publisher’s Weekly lists. The movie shows only a small part of his activities, but does a masterful job of telling the story accurately and with sensitivity and even compassion. The movie broke crowdfunding records – it raised $2.3 million from nearly 30,000 donations. As sad as the subject matter, we are left with a positive ending, and the satisfaction that, at least in this instance, justice was done. You’ll find the heartbreaking photo of Baby Boy A under the “resources” link. While I am a regular congregant and chorister at the Episcopal Church of the Epiphany in the deep south of Louisiana, I have sung for my “other church family” at Temple Gates of Prayer. The setting of the season of High Holy Days is a perfect time to share with you a miracle – that to me, just goes to show (again) how much God can do with the smallest, simplest things. Over two months have passed since Joshua and I visited the Children’s Holocost Memorial in Whitwell, Tennessee. I can still barely find the words to write about it. This amazing memorial is at a middle school in the mountains of Tennessee, northwest of Chattanooga. Friends Diane and Vickie suggested we visit there after we’d spent time with the sisters of the Community of St. Mary in Sewanee. I’m glad I had that dose of peacefulness to strengthen me before visiting the memorial, which still has me in awe. Over the years, the 8th grade classes at Whitwell Middle School have learned about history, prejudice, and the holocaust through this amazing project that has changed hundreds of thousands of hearts and lives. Sign at the entrance of the Memorial. “You should go see this,” said our friends. “It may not be open right now, because it’s at a school, but you could at least try” and they tried to describe the Paperclip Project. In the end, Diane sent us off with a DVD that we watched later that evening. The rest, as they say, is history. The students began collecting paperclips, with the goal of 6 million paper clips. After a slow start, the idea exploded, with help in part from a German journalist husband and wife team who were working in the United States. Over the following years, the students collected over 30 million paperclips from all over the world. In 2004, a documentary film was made (the DVD that Diane loaned us). The project expanded exponentially, and became much more than just a class exercise. The project came to change the entire town, and impact everyone who has seen it. The day that Bubba and I went was a quiet summer day, and Whitwell is off the beaten path and away from the tourist attractions of Chattanooga and Nashville. The town and school are not diverse in population, which is initially one reason why the school chose to learn about the holocaust. In addition to learning about history, there were lessons in tolerance to be learned as well. We drove up in silence. The car sat on a length of track, which rested on limestone. A wheelchair friendly ramp led to the open door of the car. Butterfly bushes were planted nearby, and mosaic butterfly stones and sculptures were around the car, as was an iron fence. So richly, brightly, dazzlingly yellow. Is carried lightly ‘way up high. But I have found my people here. And the white chestnut candles in the court. Only I never saw another butterfly. That butterfly was the last one. This was written by Pavel Friedmann, dated 4.6.1942 . Pavel was born in 1921 in Prague, and was deported a couple of weeks after the poem was written. He was murdered in Auschwitz in September of 1944. After spending a long walking in silence around the outside of the fence, Bubba finally spoke. “Want to go inside?” he said. “But it’s locked,” I replied. “We can get the key. Look.” He pointed out the sign on the gate that I’d missed; the key was available at a local grocery. We drove into town, sharing few words. The grocery was on the main thoroughfare, and I pulled in next to a motorcycle. “I’ll get it,” I said, grabbing my wallet. After all, they would want some ID, right? “Hi, is this where I get the key to – “ the young lady smiled, said “yes m’am, here you go” and handed me a key (on a giant paperclip keychain). I stopped in midsentence. Wow. Thank you. I got back in the car, unused to this simple, honest, open greeting. We drove back to the Memorial. I walked over to an area near the parking lot, with stones lining a drainage ditch, and selected a small, smooth one. I walked along the sidewalk, and also selected a piece of limestone. We unlocked the gate, and stepped in. I don’t know how long we stayed . There was no sense of time. I walked around, finally getting the nerve to touch the cattlecar. It had been cleaned, repaired, and “disinfected.” The car had been used for the most nefarious of work, bringing innocent souls to the slaughter of the camps. Blood, tears, secretions of body and of spirit were soaked into the wood. After the war, it had been adapted to use for hauling grain. From hauling innocents to death, to hauling food – grain. Was it on the path to being forgotten? Or was this a metaphor as well? I expected the wood to scream at me, saturated with grief and terror. Yet, it didn’t scream as I’d anticipated. It whispered, and I couldn’t quite make out the whispers. It wept. I walked around the outside of the car, the open doors eye level with me. I left one piece of limestone on the outside of the car, and saw where many other visitors had left their stones of remembrance. I saw life in the butterfly garden. One memorial stone was placed in honor of the Jehovah’s Witnesses who were murdered by the Nazis. Coincidentally, about the same time as I visited this memorial, my mother was back home, having coffee and visiting with a relative from New York – the daughter of a cousin who was a Jehovah’s Witness. I finally walked up the ramp and into the car. The doors were both open, and the sides were partitioned off by plexiglass. Behind the plexiglass were 11 million paperclips. ~A vintage, battered suitcase from a school in Germany filled with letters from German students, written to Anne Frank. ~Kippahs from Bar and Bat Mitzvahs, adorned with paperclips. ~Books, and a copy of the Mourner’s Kaddish. ~A beautiful Mezzuzah, sent from a Jewish Congregation (in Ohio, I think) was on the door of the car. God’s word welcomed all who entered, regardless of faith. Sign above the paperclips, and the suitcase from schoolchildren in Germany. My own reflection, witnessing. Standing in this car, I wondered how many thousands of souls were forced to ride it, in misery and terror. Today, this cattlecar stands as testimony and reminder: Never again. It serves as a focal point for former, current, and future students who are all involved in the Paperclip Project. Students greet visitors, give tours, answer questions. The heart of this project has grown to encompass the entire community of Whitwell, and people all over the world; art blossoms at this Memorial, reflecting the desire to be a part of this reminder, this hope, this healing. I left another stone at the edge of the paperclips, and prayed. As much of the Mourner’s Kaddish as I could remember, Hail Holy Queen, and the words of my heart. (After all, what else is an Episcopalian with Catholic roots who says “my other church is a synagogue” going to do?) It’s all God, after all, and prayer is prayer. I prayed, and I listened, actually somewhat confused at what I was feeling and at what I was not feeling. One thing was certain: I will not forget. I was anticipating angst, fear, horror. I felt horror…but also some calm, peace, hope, and healing. The lives lost can never be regained. Yet the healing power of this project which grew into an international effort cannot be denied. I was left awestruck by the power of a simple paperclip and a desire to make a difference, no matter how small. As I write, I recall reading something about a man who bartered his way to a house, starting with only a paperclip. The students of Whitwell Middle School started with an idea, and a simple paperclip. Even the smallest thing, teamed with love and vision, can make a huge difference. “I know,” replied the young woman. She told us that she was a teacher, who came to visit the Memorial every summer. “Thank y’all for keeping that key available,” I said as I left. “Being able to walk inside was – incredible.” She smiled. I had no words; it was hard enough to find those. I’ve thought of two words to describe the Children’s Holocaust Memorial: Healing Miracle. Beyond that, you’ll have to visit it yourself, and I urge you to do so. Submitted to the DAR Women’s Issues Essay Competition. It received state honors (Louisiana). OK, Charlotte, here it is. I suppose I’ve come to that “wise woman” part of my life, even though I don’t feel wise. I am a wife, mother, office manager for my family business, songwriter, and vocalist. I am occasionally asked for advice by young singers. I tell them that a vocalist can never replace their instrument. If it gets damaged or broken, we can no longer sing – or we must find a way to deal with the damage. This is the story of my own damaged instrument. Not my voice, but my ear. My advice to young vocalists has expanded to include: If you ever experience sudden hearing loss, it is a medical emergency. I tell them about the symptoms of Meniere’s Disease. I juggled singing with job and family life. I sang with my blues band, at my church, at our local Jewish temple, and with my music partner in our Gospel duo. God makes each of us an instrument, and I did my best to learn to use and care for my musical instrument. Call me “Queen of the Earplugs;” I treasure my ears. Earplugs don’t help with allergies, though. For years, I’d have occasional bouts of clogged ears and dizziness during high allergy seasons. One December day a few years ago, my ears clogged. I thought it was allergies, or possibly I’d caught my husband and daughter’s virus. I had things to do at the office and two sick ones to care for. I knew what this was, took ibuprofen and antihistamines, but it got worse. I couldn’t hear anything clearly in my left ear. While it had been several years since my last “spell,” I’d had a severe dizzy day recently, so I saw my ENT, who was familiar with my history. I expected the usual cortisone pack, but this time he looked at me with concern when I told him this had lingered for three weeks. I knew from his expression that something was different this time. This should have run its course by now, he said. He prescribed cortisone and an antifungal. “When will my hearing return?” I asked. “Let’s wait and see what the medication does,” he replied. I took what felt like a never-ending course of cortisone and Valtrex. After a month of medication, Dr. Robert ordered an MRI. Fortunately, there was no tumor, but no answers either. I went to the audiologist for a baseline audiogram. There was nothing but noise and pain in my left ear. Results? My right ear was good, but my left ear showed a profound hearing loss. I took a copy of the report home, filed it away, and cried. I cried me a river, as the song says. How ironic. I told only family and closest friends. I quit scheduling band gigs; even with earplugs jammed into my ears, I was afraid to take any chances. Meanwhile, a bizarre group of sounds had moved in where my hearing used to be: Tinnitus. In different keys. All at once. Dr. Robert had told me that we needed to wait a year, as there was a chance that my hearing would return with time. Meanwhile, I had this invisible, sudden, crippling loss that I couldn’t even talk about or escape. After asking my husband to repeat something for the third time one evening, he voiced his frustration. “Are you DEAF?” he cried. “YES, I AM.” I replied. “In one ear. Half of everything I hear is GONE.” He felt terrible. So did I.
I began telling a few people about my loss. I was shocked at some of the responses. Really? I’m the one wearing earplugs, remember? I have the small band that is known to be considerate of noise levels. My response was anger. Then, there was the well-meaning advice about earwax, about this doctor, that diet, this treatment, etc. No, a cochlear implant would only destroy the way I hear music. That year was one of adjustment, resignation, and hope. In many ways, I had to relearn to sing because I had to learn how to hear again. Our brains are wired for stereo, and that was lost to me. I quit going places where a large group of people gathered because I could no longer discern voices in a conversation. I quit going to movies and concerts and any live presentation because they were hard to follow. Everything was a wash of noise, coated with a blanket of anxiety and occasional panic. I considered hearing aids, although I had no idea how to pay for them. We had two children in college. This was hope, though: One day, I can get hearing aids. I longed to hear in stereo. I wanted the safety of knowing where a sound originated. If someone called my name, I had no idea of where to turn. I don’t know where a siren or horn is coming from in traffic. I wanted to hear music in stereo. When the year was up, I went back to Dr. Robert and the audiologist. I was hopeful, as Erica, the audiologist, had successfully fit my father with hearing aids. I was determined to put up with whatever adjustment was needed. Surely no hearing aid noise could be more obnoxious than tinnitus! The testing was similar to a routine audiogram. Erica explained that the noise and sounds and speech I would hear in the headphones would be adjusted just as it would be with a hearing aid, so we would find out whether or not a hearing aid would help me. Whether or not? I hadn’t realized there was a chance that this wouldn’t work. Today’s hearing aid technology is phenomenal. From what I knew about audio engineering, the ability to adjust amplification of specific frequencies in a device so tiny was nothing short of a miracle. Unfortunately, this miracle was not to be mine. No amount of amplification or adjustment made a difference – only physical pain. I sat in Erica’s office and sobbed as she held my hands and offered tissue, understanding, and honesty. The cilia, the microscopic hairs of the inner ear that enable us to hear, were dead. No diet, supplement, medication, procedure or technical device would restore them. I faced a life in monaural, but at least I had one functioning ear. I learned about Meniere’s Disease, and saw my history written in what I found. Dr. Robert’s suggestions to address the vertigo were basically the same as for Meniere’s, but I felt defeated as I learned that no one knows the cause of the illness, and there is no cure. My years of periodic spells, interspersed by periods of feeling normal, had a name. Interestingly, it affects more women than men, and the possible causes include infection, allergies, head injury, stress, fatigue, migraines, respiratory infection, and an autoimmune response. I wasn’t too surprised that women experience Meniere’s more than men. It usually affects one ear, but sometimes attacks both over time. I cannot dwell on that. It is critical for me to maintain my balance, and I mean that metaphorically as well as literally. It’s not always obvious that I have a hearing deficit, but an astute observer will notice. I’m getting better at lip-reading. In music, I seek the right position to hear what I need to hear in order to sing. In any group seating situations, I tell the person on my left “I’m deaf in this ear. If you say something and I don’t respond, it’s because I didn’t hear you.” I’ve learned to deflect the still-painful topic of hearing aids by saying “it’s a sensorineural hearing loss, which cannot be fixed by a hearing aid.” I’ve learned that such queries are usually out of concern. I also tell others that sudden hearing loss is a medical emergency, even if you’ve had it before and you think “oh, allergies.” I also tell them about Meniere’s Disease. On the positive side, the dizzy spells have mostly stopped; this, too, is typical of Meniere’s. As for singing, I’ve had to hyper-focus my sense of pitch, which has strengthened my vocals. I’ve heard of other vocalists who have experienced a similar hearing loss who have quit singing. I can’t not sing. I have found a new way of listening, and a new way to focus on the experience of singing. It is a whole-body expression, as you must feel the vibrations and melody in your body. Your mind, throat, ear, mouth, lungs must know how the notes feel as well as how they sound. Perhaps it’s similar to the heightened sense of hearing that some vision impaired people have; I am partially deaf, so I have an enhanced sense of certain facets of singing that some take for granted. How can I keep from singing? At a Women at the Well concert. Photo by Rev. Kemper Anderson, at St. James Church in Cedartown, Ga.
About three years into this journey, my music partner and I were preparing to go on a short tour of several churches in the mid-Atlantic states, performing our original Gospel program about Jesus’ women disciples. We had recorded several of the songs from the program, and I longed to re-record some vocals and add harmonies. Singing overdub harmonies is a challenge when you have only one functional ear. I managed by notating the harmonies, placing the headphone behind my one good ear, and forging ahead in spite of fear deep in my soul. What if I couldn’t do it? But I could, and I did. A few days later, after the vocals were mixed, we shared the tracks with a friend. Danny is a gifted pianist who tours worldwide and has done a lot of recording and harmony vocals. He knows of my hearing loss, and was floored when he heard the harmonies. It finds an echo in my soul. How can I keep from singing? Two highly visible suicides this week bring that subject into the forefront for the time being. For survivors (family and friends left behind), suicide will always be with them. For those who live with depression, thoughts of suicide are often there. For the rest of the world, well, we’d just rather not think about it, right? I’m not practicing professionally right now (I’m a Licensed Clinical Social Worker), but keep my license current and never stop learning. Suicide prevention is a subject that people will ask me about, and I know in at least some instances they ask me because I’m NOT currently “working in the system.” So I urge them: If someone has verbalized thoughts of suicide, take it seriously. How often have you heard “I just can’t see how someone can do that?” When someone takes their own life, they’re not thinking right. It’s not a rational act, no matter how much the Suicide may rationalize it. “I have no way out.” There is always a way out, a way through that doesn’t entail leaving this world. Remember, that person is in a dark, dark place. If you can’t see how someone can do that, you don’t understand the darkness. Be glad you’ve never been there. And if you ever find yourself there, I pray you’ll hang on to a glimmer of hope that things can get better, and seek help. Hope – and help – is always on the horizon. That’s just bull. The God I know isn’t like that. The God I know can – and will – forgive anyone! Is the soul’s journey over at the end of human life? Of course it isn’t. The body’s life is done, and so are the physical limitations of the body. I believe one can ask forgiveness even free from the earthly body. I don’t believe that God says “too late, had your chance, muffed it” and zaps the soul into eternal hellfire. Besides, deep depression has a physiological component. I’ve heard news-chatter over the past few days that “more people are taking antidepressants than ever, but we have more suicides than ever, so…they’re not working?” That’s a pretty simplistic way of looking at things. There is a great sense of despair, confusion, and uncertainty in the world – and we’ve become a more secular society (to the point of forcing God out of everything as much as possible). Hmmm, could the two be connected? The almost total elimination of the Divine from our public life is a far cry from “Congress shall make no law respecting an establishment of religion, or prohibiting the free exercise thereof.…” We don’t have a state religion, but God has been shoved aside in public life because heaven forbid we should bring, um, heaven into the discussion!! The explosion of antidepressant use has many reasons, and I think that one reason is that it’s no longer as much of a stigma to seek help for depression. Another is that we live in a sea of stress. Fr. Matt recently gave a sermon on keeping the Sabbath. We don’t really do that anymore. Even for families who attend church on Sunday (or possibly on Saturday afternoon for my Roman friends and family), the rest of the day is often taken up with work. And if you enjoy Sunday dinner, someone had to cook it. The point here isn’t that taking a day off will prevent suicides. But perhaps reshaping our societal values so that we value down time and use some of that down time to reconnect with the Divine would help to ease the stress. When was the last time you noticed the little things? Take time to relax. Get outside or dive into an art museum. Read a book. Go for a walk. Go fishing and enjoy the world God made for you. Do something nice for someone else. Tell someone you love them. Listen for the still, small voice inside of you. That still, small voice may guide you to be an angel to someone else who really, really needs an angel. God can, and will, use us if we allow it, and if we listen. Be kind. Smile at friends and strangers alike. Sure, we can show the love of God in big ways, but it’s the little opportunities that come up a lot more often, so smile because you’re a beloved child of God. Smile because we’re all in this together. You never know the inner battle someone else is fighting, and a simple smile just might make all the difference. I just learned that today, June 2, is… (drum roll)…. Seriously. I don’t know who comes up with these things, but on the National Day Calendar website, June 2 is listed as National Bubba Day. Now, this is cause for celebration of All Things Bubba. You see, Bubba is the other “B” in B & B on the Rock, my Gospel duo that performs the Women at the Well program and other spiritual music. You may have encountered this particular Bubba in this blog in the past in this post and this post. However, since it’s #NationalBubbaDay, this post will celebrate Bubba-ness. First, a bit about Bubba-ness in general. Bubba is usually a Southern Thing (sort of like the word y’all), and is sometimes looked down upon by folks in other parts of the country who don’t understand. (Bless their hearts.) “Bubba” usually came about as baby-talk from a sibling who couldn’t quite say “brother.” Everyone usually has a few Bubbas in their life, and they are almost always the nicest guys you know. Sometimes the quirkiest, too, which is a good thing. In Louisiana, Bubbas make you think they’re just a good ol’ boy, and then Cajun-engineer a solution to a problem that you didn’t know you had…and you’ll thank them. Or laugh your head off. Or both. Seriously, Bubbas are usually very, very smart – and hide it from you. Never underestimate Bubba. The particular Bubba in my life, my brother-from-another-mother, Joshua “Bubba” Murrell, is extremely intelligent and creative. He’s a loyal friend, great music partner, and certainly is…entertaining. He’s also a Grammy winner. This guy can make music with just about anything (even a straw) but builds guitars. He also builds virtual rollercoasters and theme parks for fun, but watch out if he gets around a go-cart or other fun, driveable thing. What, you can rent one of these? ALL IN!! I’ve known Bubba for a long time, and we’ve embarked on many a creative venture. He’ll take inspiration and run with it. My husband once built a potato gun – one of those lovely PVC pipe creations that shoots potatoes. Bubba got inspired and built one as well, and painted (camo) and added a laser scope. Ah, the Bubba-ness! Then, there are the bonfires. Every few years, when the weather cooperates and we can acquire the wood, we have a family bonfire that seems to have grown bigger and bigger. Building a bonfire. I’d call it Bubba-engineering, but this is a team effort between Bubba, Greg (above) and David, so we’ll call it “Cajun Engineering.” They’re very similar, anyway. Comedian T. Bubba Bechtol, also a highly successful public speaker, explains the essence of Bubba-ness and even has a “Bubba Code” at www.tbubba.com. He’s also (like the Bubba I know) a wholesome guy, not given to shock comedy or the like; it’s clean and funny.. He points out that “T. Bubba’s Church preference is “Brick”. Which pretty much sums up the essence of Bubba-ness: Live and let live, it’s all God, don’t be afraid to explore, and don’t be afraid to be crazily creative. Today, celebrate #NationalBubbaDay with your favorite Bubba! And if you don’t have a Bubba in your life, well, bless your heart, you poor thing; you just don’t know what you’re missing.